I’m pregnant with baby #7. And I am working on teaching free childbirth classes in my community. 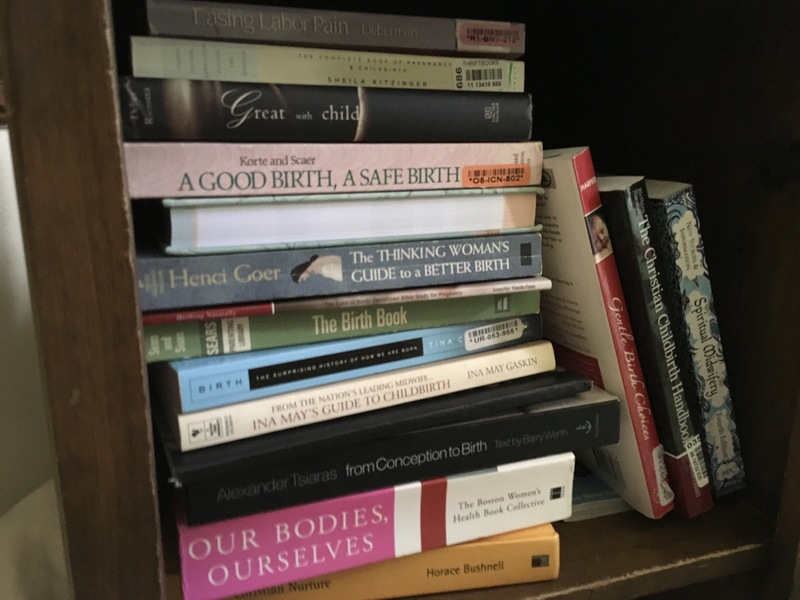 So I had every single childbirth book I own scattered across my dining room table. I often have people ask for recommendations, so I figured I’d share that particular “bookshelf” and tell you my thoughts on each, in case you were interested. A really encouraging and insightful look into the theology that goes along with pregnancy and childbirth. Very eye opening and brings even more meaning into this part of your life as you better understand how pregnancy and birth reflect our God. I very, very highly recommend this book. Full of birth stories and real practical advice for natural childbirth. Helps you more fully see the role women play in bringing forth life as well as gives you the practical tips and tricks of the birthing trade. Kind of a substitute for that passed down from woman to woman information that we have lost in our modern culture. Most of the birth stories are very “hippie”. And some of it definitely has a new age vibe to it. Very informative book on birth. A little dated. No frills. No fear mongering. Just information. A devotion for pregnant women. Now, this one goes a little far out there. It definitely isn’t for everyone. I think Holy Labor is much better. But this book does have some good reminders, if you can take what helps you and leave the rest. If this statement bothers you: planning to have an epidural in a normal labor is lack of faith on your part because you aren’t trusting God to get you through. You should skip this book. The book is really short, only 70 pages, with a lot of breaks in there for questions and such. If you are really hormonal and sensitive, this may not be best to read while you are pregnant as some of the information is really disturbing. (Human history is always tainted with the disturbing.) It really isn’t just a book for moms, but anyone interested in the history of how we give birth. It definitely makes you view birth choices in a different, more cultural, less “right and wrong” sort of way. Understanding where we have been and why some things still are the way they are. Very interesting, and slightly disturbing, read. As an information junkie, this book is one of my favorites. I have read and reread and rereread this book. I’m surprised my copy is still holding up. It is the science behind childbirth choices. Laid out in a pros and cons sort of way with all sources cited so you make your own birth decisions. Yes, the author does give her opinions at times, but the evidence backs those up. Extremely informative. Extremely helpful. This is a really helpful introductory guide to having a natural pregnancy. What things should I really be avoiding? What nutrition should I really be focusing on? Is red clover safe during pregnancy? What can I naturally do for heartburn? Those are the sorts of questions this book answers. I even have mine all tabbed for quick and easy reference. You’ve seen The Business of Being Born movies, so you decide to grab the book. Good call. This is like a dumbed down version of Henci Goer’s book. It is much more for the average person who doesn’t want all the studies cited and statistics quoted. It gives you your options, pros and cons, and you make your choices. I mean, let’s be honest, you’ve seen the movie, clearly there is going to be a slant toward the natural side of things. But I do think they tried to be as informative and non-biased as possible on the subject. Some things in American Obstetrics are just wrong and it is hard to find any words to justify them. I do recommend this book. I actually recommend it in person more often than The Thinking Woman’s Guide, simply because of accessibility. This one seems more for the masses and not just science nerds. First, the picture on the cover is just adorable. Tell me that little face doesn’t make you look forward to giving birth. Gentle Birth gives you some of the history of modern obstetrics along with more natural alternatives to common practices. Very pro-midwifery. Very challenge the system. It has good information, even if you are planning a hospital birth. Although, if you know you are delivering in a hospital, you may want to try other books, since this one might increase your anxiety about it. When I first got this book, I thought, “What on earth have I just purchased?” However, it has been extremely helpful over the years. I have read and worked through it multiple times and recommended it to people. This book helps you recognize your preconceived ideas about childbirth and address your fears and traumas through art therapy. It sounds very woo, but it is incredibly helpful. It does have a slight new age vibe, as I find so many natural childbirth books do. But if you find yourself anxious about childbirth or needing to process your birth experiences, this book can help you do that. Basically, if it has the words “Christian” and “Childbirth” in the title, I’m going to buy it. I am always looking for really good Christian alternative for the new age stuff that seems to be so prevalent when discussing natural childbirth. I have found I can glean wisdom from those other sources, but not deep understanding and deeper meaning. This is much better than her Lord of Birth devotional. There is the informative stuff, and the author is very pro- natural birth. But there are also Bible verses throughout, which I found to be helpful. I do like this book. And this book is much bigger. It is 400+ pages of actual information, not a devotional, though it does have devotional thoughts. Again, in my search for good Christian childbirth books, I came across this one. Some of this one is a little hokey and just not for me. It does have good information, it just isn’t laid out in the most user friendly way. I do like that it includes Scripture to read. However, it isn’t really the best Christian childbirth book I have read. It is good, just not awesomely great. This book is very new age. It has a lot of very hippie birth stories, which can help dispel the fear of the birthing process. I found the birth stories prepared me better for birth than anything else. This book also has a lot of really great information. The second half of the book is basically a midwifery textbook. And while I really enjoy that sort of thing, not everyone needs that level of information. The birth stories are probably the more popular reason for buying this book. The stories were similar to Ina May’s Guide to Childbirth, but I still thought they were worth the read. This book has a very basic week by week pregnancy guide in the front of the book. Then gets into the standard pregnancy book stuff. Like a better version of What To Expect When You’re Expecting. It has good information, full color pictures (some are graphic, because… birth), and helpful tips from pregnancy all the way through birth. A very good book to cover all the basics. Like a childbirth class in a book. This book is specifically natural labor techniques. If you are planning an unmedicated labor, this book would be a good one to read. I found it more helpful than the Bradley method or Lamaze breathing techniques. This one has actual helpful things to prepare for labor and then for handling labor once you’re there. This book is a week by week guide to pregnancy and a pregnancy devotion book all in one. Each week has information about your growing baby, a prayer list for that week, a memory verse, and then several individual devotions to do throughout the week. There are 4 devotions per week, so it isn’t a daily thing. But it has room for thought and reflection. This would make a really lovely gift for the expecting couple, or buy it for yourself as you walk through each week of pregnancy with your focus on God. It can be used as a journal, as there are places to write in answers to questions, thoughts, feelings, etc. on the pages. There are specific versions for pregnancy, but I have the big women’s health reference book. Honestly, I just don’t like it enough to bother with the Pregnancy version. Extremely liberal. Not my cup of tea at all. With information from everything from addiction and relationships to anatomy and menopause. I just found there was way more political and opinion writing that actual scientific information. It isn’t a book about health, but rather, feminism with some anatomy and health related issues thrown in. This book goes through birth options and birth issues. Even a chapter called, “How to Have A Normal Vaginal Birth”. (How sad is it that we have gotten to the point where to norm is now something we have to seek after and really try for?) It has really good information, I just think The Thinking Woman’s Guide to A Better Birth and Your Best Birth lay it out a little better. A good book, but not necessarily my highest recommended one on these specific topics. This is more of a memoir. The ramblings of a mother through her pregnancy. It is very poetic and thoughtful. I wouldn’t necessarily say it is of any “help” in pregnancy and childbirth or even a book to only be read through pregnancy and childbirth. It is more of the internal musings of becoming a mother and carrying another person inside you. This is a week by week guide, which I love. Something about weekly pregnancy guides. It must not just be me since there are dozens of week by week pregnancy guides and apps out there. This guide is for us crunchy mamas. Although, I would actually say it is Demi-crunchy. I have definitely seen more hippie types. This si much more balanced. Very similar to The Natural Pregnancy Book, only laid out in a weekly style. My favorite thing about the book is the recipes included for each week. The specific nutrition focus is based on how the baby is developing that week, so big brain weeks, the recipes are fish. Plus, the recipes are ones I will actually use. Like, stuff I can actually find and make and will willingly eat. I am absolutely loving this book! Again, another silly baby name book. This one is primarily lists. What did celebrities name their kids? What about rappers? Ooh, what are names of models? How about their kids? Those are the sorts of things in this book. You’ll find normal name along with Danger Mouse and Moxie Crimefighter. It is totally amusing. You may find THE NAME in here. Or maybe you’ll just find a name to tell your Mom to get her to stop asking you what the baby’s name will be. This is a coffee table picture book. It has the little close up pictures of sperm meeting egg. Then you have the pictures as the cells duplicate. Then pictures of the baby as he develops. My kids love looking through this book. I’m not standoffish at all about how babies are made or how they are born. These are the facts of life, so I don’t hide these from my kids. They mostly focus on the development pictures and like finding pictures that correlate to their new sibling’s current stage. Look! She has a tail! We have gotten a lot of use out of this book. I still have the old version of this book, not the new updated version. So my take is that the old version is old. It is more of a month by month guide, but I don’t think in terms of months when I am pregnant. I think in weeks. When someone asks me how many months pregnant I am, I honestly have no idea. Purple? My brain just doesn’t process pregnancy in months. Maybe that is an age thing, I don’t know. I think the book has good information in it. It just never was my “reach for” book. I read through it once or twice, and then it has been a bookshelf sitter. I can feel some people rolling their eyes so hard right now. But seriously, you gotta keep it balanced, people. I need info from all sides. And then I can roll my eyes at them. This is a week by week guide with actual mom concerns. It is very mainstream. And it has some bad information in it. It isn’t bad, but you can honestly get this information on Babycenter for free, along with the asinine comments from random people along with it. Plus on Babycenter, you’ll get the added bonus of someone’s drama that is better than watching soap operas. Really, I don’t know why Babycenter is considered “expert” advice. It should just be considered “advice”. And like all free advice, take it for what you paid for it. Now, the book, sure, buy it if you want. But Mama Natural is a much better week by week guide and other books have much better “experts” giving advice.